Jielai was born in China before moving to Australia where she grew up and studied for her first degree. She completed her PhD in Canada at the University of Toronto in astrophysics and astronomy, studying galaxy evolution and formation, and low surface brightness imaging. 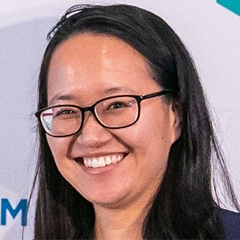 As a Schmidt Science Fellow, Jielai is pivoting from astrophysics to medical imaging, with the aim of bringing the strengths of both fields together. Jielai is completing her Fellowship placement with Prof Alison Noble at the University of Oxford. She is working across two projects. The first project is to produce refined atlases of the developing fetal brain using 3D ultrasound data alongside algorithmic processes to learn about the brain development of fetuses effected by congenital heart disease or were born small for their gestational age. The second is to use routine fetal ultrasound videos and related multi-modal data to explore the systematic improvement of clinical image recording. Jielai’s science has the potential to improve ante-natal monitoring and fetal outcomes. Jielai has a strong committed to international scientific collaboration and has played a key role in the development and organization of the West Africa International Summer School for Young Astronomers. Read Jielai’s blog on the 2018 Oxford Global Meeting – ‘Friendship and ethics’.